Fast Paper Black Double-Sided 16 Compartment Literature Display F276N01 – MF88105 – OfficeYoo! 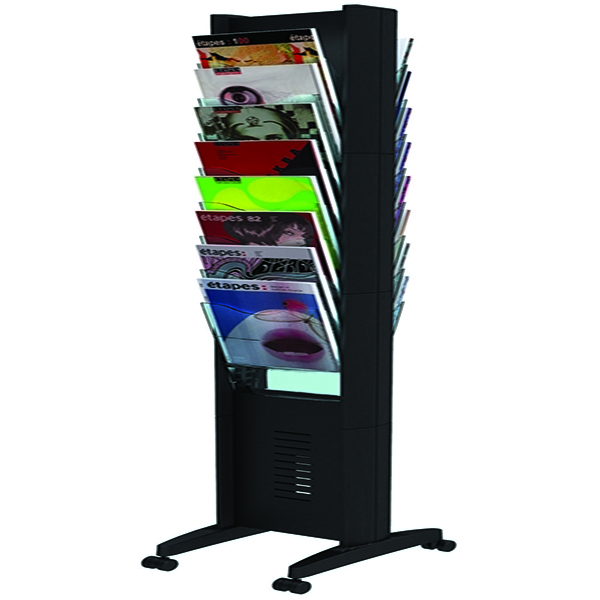 Great for conferences, receptions, waiting rooms and more, the Fast Paper Double-Sided Literature Display lets you display a wide range of magazines, catalogues, journals and more for your visitors. It’s double-sided for double the capacity, with eight compartments per side (16 total) designed for A4 magazines, journals and more. The sleek black design will suit any office enviornment. Durability is provided by a metal frame sitting on four castors, ensuring easy mobility for a flexible arrangement.